I’ve been doing a bit of baking lately, which means it’s time to share more of my baking adventures once again. I made these cookies for the first time back in the fall of 2013. I snapped a few photos then, but never got around to editing and posting this recipe. 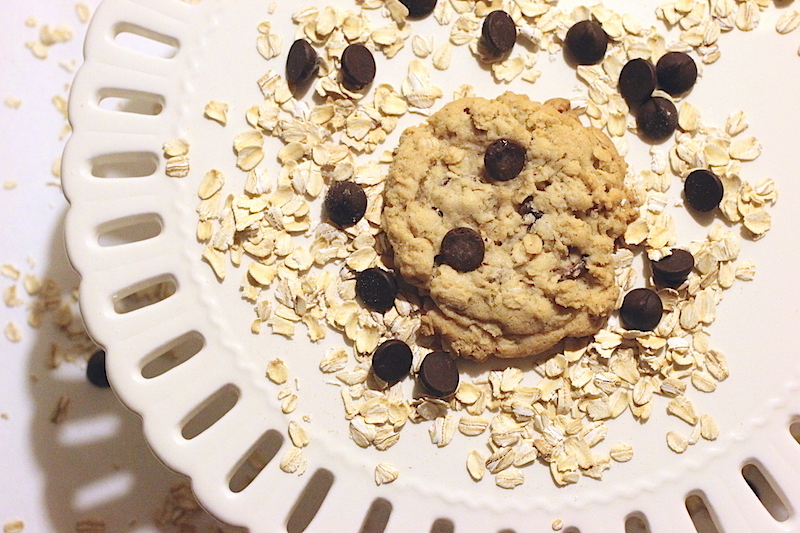 Fast forward to last Saturday when I was in the mood for baking some cookies. 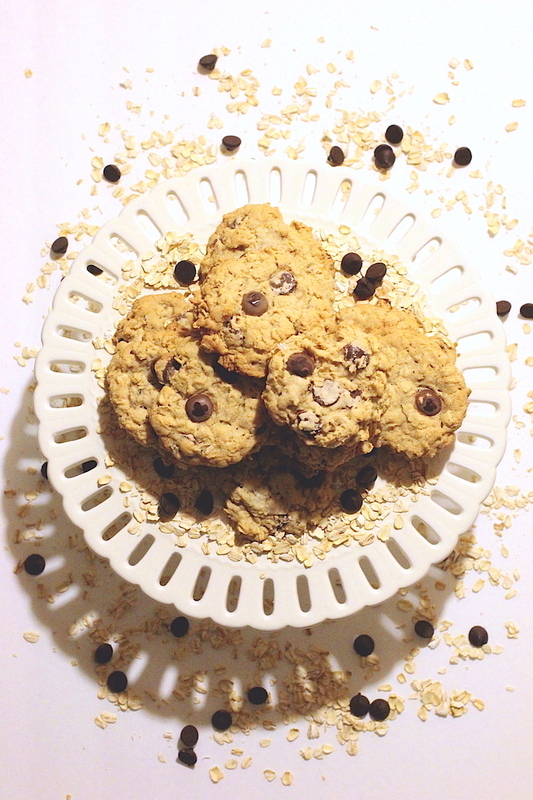 Since I have been keeping oats on hand lately to make granola, oatmeal cookies came to mind and I had to turn to this recipe again. My favorite thing about this recipe is the hint of cinnamon that adds to the flavor palate. I feel that the spice intensifies the chocolate making these cookies quite enjoyable because who really likes raisins in their oatmeal cookies? 1. Preheat the oven to 350°F. Line large baking sheets with parchment paper or silicone baking mats. 2. In a medium bowl, whisk together the flour, salt, baking powder, baking soda, and cinnamon. 3. In a large bowl, use an electric mixer to beat the butter, granulated sugar, and brown sugar on medium-high speed until smooth and well combined, about 1 to 2 minutes. Beat in the eggs and vanilla. 4. On low speed gradually add the flour mixture and beat until just combined. 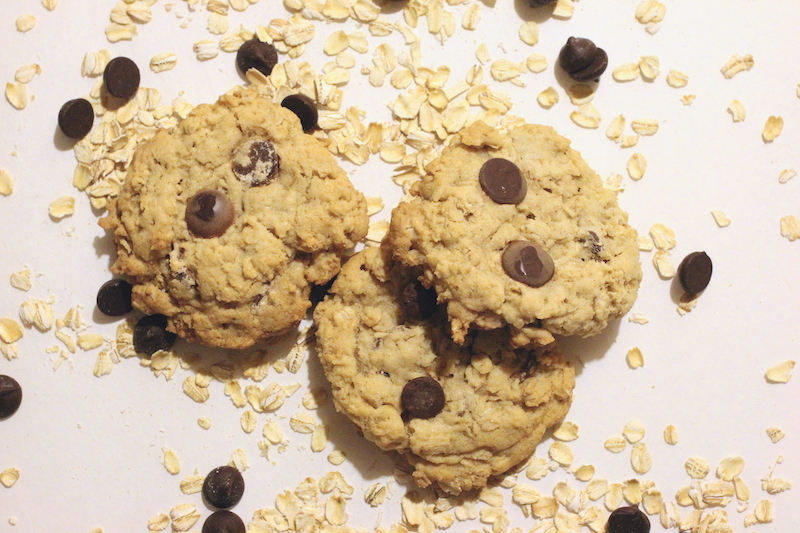 Use a rubber spatula to stir in the oats and chocolate chips. 5. Using a spoon or spring-loaded scoop, drop 3-tablespoon sized balls of dough onto prepared baking sheets. Flatten slightly with the palm of your hand. 6. Bake for about 14 to 15 minutes, or until the edges are slightly browned, rotating baking sheets halfway through. Let the cookies cool on baking sheets for 5 minutes before removing to wire wracks to cool completely.